Modular InfoTech Pvt. Ltd. is a private limited company, established in 1983 by a group of engineers having a strong R & D background. Modular InfoTech is located in Pune, which is about 3 hours journey by highway from Mumbai (Bombay). The Company is ISO 9001:2015 Certified, is registered as an MSME Enterprise (Government of Maharashtra), and is registered with NSIC (Central Government). The Company has CRISIL rating of SE 2B. This rating indicates High Performance Capability and Moderate Financial Strength. Modular made pioneering efforts in developing a totally indigenous microprocessor based CRT phototypesetter. Modular InfoTech made a niche for itself in the Indian Language DTP market by developing software packages for the DTP segment. its flagship product is Shree-Lipi. Combined user base of Modular’s language products is over 650,000. Modular InfoTech has pioneered in developing the largest library of Indic fonts in the world, of about 3800 Fonts for the 10 Indian Languages. Modular has also developed fonts for Arabic, Sindhi, Russian and Sinhala. Modular InfoTech has expertise in developing the fonts in Open Type Font Technology. Modular undertakes scanning and digitization services for the following segments – government and public sector undertakings, educational institutes, religious institutes, shipping segment, corporates. 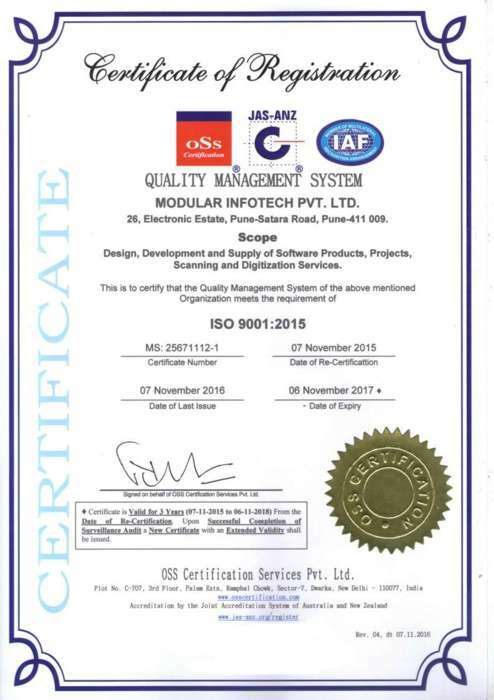 Modular has a branch office in Singapore doing scanning and digitization, mainly for shipping companies, hospitals and government. Modular has a subsidiary company in Hong Kong, Modular Infoteck HK Ltd., doing scanning and digitization work there. "To develop innovative products and maintain the lead by keeping customer satisfaction as the primary goal. To enable customer success through a proactive, result oriented & quality driven approach resulting in our being a preferred outsourcing partner." We empathize with the customers and aim to deliver what the customer expects from us in terms of prompt service, quality and competitive pricing. We believe that our people are our most important resource driving our business goals. Modular InfoTech has an impressive team of Board of Directors who consistently inspire the team. Our management team consists of people having experience in the consulting and technology, providing a strategic direction to the organization. In keeping with its commitment to excellence, Modular InfoTech Pvt. Ltd. has the right mix of hardware and software required for software development, testing and an effective electronic data and document conversion process. Spread over 9000 sq. ft, our work areas are clean and spacious providing a conducive work environment for our software developers, testing staff and operators. To ensure an uninterrupted implementation process we have disel generator of 75KVA during power failures. We use standard as well as customized software to encode, enter and verify data. Our in-house software professionals develop proprietary software systems and tools to develop customized solutions as per requirements of every job. We have leased line internet connectivity with back up of broadband line to ensure 24X7 uptime of our FTP, Mail and Web Servers. Modular's focus on customer service and quality management has enabled it to maintain a 100% track record of long-term relationships. The company is currently engaged with over 700,000 customers including several from the Fortune 100 list and has formed enduring relationships with global giants like Microsoft, Sun Microsystems, Rediff Mail and Wockhardt etc. Modular has also formed strategic technology associations with global technology leaders such as TCS, Microsoft, Google, Samsung, RedHat, Sun Microsystems etc. These associations enable Modular to leverage its core competencies, ensuring comprehensive and state-of-the-art solutions to its customers.